Will John Bel Edwards win a second term in Louisiana? 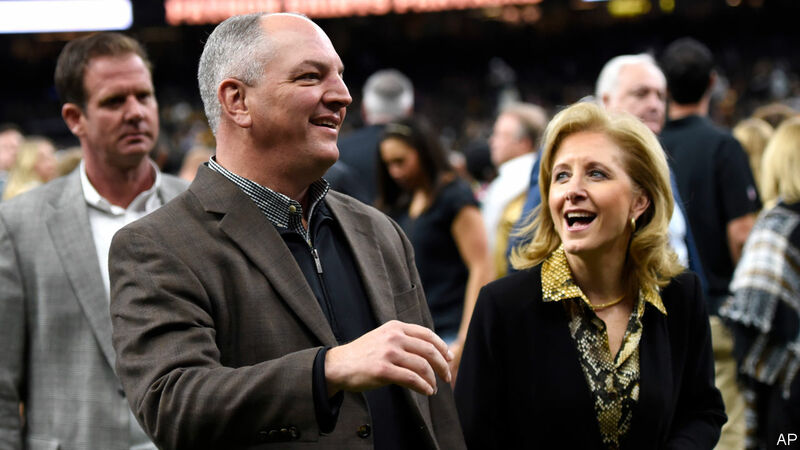 JOHN BEL EDWARDS, the governor of Louisiana, is that rare thing: a Democrat holding the highest office in one of the reddest states in America. Donald Trump won 58% of the vote there in 2016. Having become the first Democratic governor to be elected in the deep South in more than a decade, it is now looking fairly likely that Mr Edwards will win a second term in October. Republicans have portrayed Mr Edwards’s victory in 2015 as an anomaly, with some justification. He benefited from a bruising primary battle between his three Republican foes and then from a general election that pitted him against the least electable of them, David Vitter. But in the years since, Republicans’ efforts to undermine Mr Edwards have carried less weight. They have consistently tried to portray him as a liberal extremist. They have taken aim at his effort to reduce incarceration, expand Medicaid, trim tax breaks for industry and balance the budget with a sales tax. Mr Edwards, a centrist who has governed moderately, has emerged from his first term reasonably popular, though certainly beatable, with approval ratings around 50%. Finding a candidate to beat him in the governor’s race on October 12th will be a serious business for Republicans. Last year Jeff Landry, Louisiana’s attorney-general, argued that the local Republican Party needed to line up behind a single strong candidate; perhaps himself. But then he ducked out of the race, as did US Senator John Kennedy, after a long and public flirtation with it. So far, just two challengers have declared: Ralph Abraham, a Republican congressman from the lightly populated north-eastern part of the state, and Eddie Rispone, a wealthy businessman from Baton Rouge. Either man could give Mr Edwards a run for his money. Mr Abraham is well known in his district, one of five in the state. And Mr Rispone has put $5m into his campaign account, a sum that should allow him to introduce himself to a large number of voters. It still leaves him some way behind Mr Edwards, who has more than $8m in his war chest. Mr Abraham has less than $500,000. Neither of the challengers boasts the sort of high profile that the Republican Party might need. But Mr Edwards should not be too confident. His runaway victory in 2015 was also helped by low turnout, presumably because so many Republicans were fed up with his opponent. Mr Edwards also benefited from comparisons to the incumbent Republican governor at the time. Bobby Jindal had an approval rating hovering around 20% and Mr Edwards himself didn’t have much of a record to scrutinise. The scale of his win over Mr Vitter—56-44—is unlikely to be repeated. Without a punching bag like Mr Vitter this time round, Mr Edwards’s best plan may be to remind voters how dysfunctional things got when the other guys were in charge. In a recent interview, he harked back to the gloom of the late years of Mr Jindal’s tenure, when deficits ballooned in part because the governor—then running for president—refused to approve anything that could be construed as a tax. A similar strategy worked for Democrats in Kansas, another deeply red state. Though 57% of Kansas voters went for Mr Trump in 2016, in November they opted for Laura Kelly, a Democrat, over the Republican candidate, Kris Kobach. Ms Kelly’s victory followed two terms of Sam Brownback, whose popularity, much like Mr Jindal’s, took a nosedive as the effect of his tax cuts on the government’s ability to function became clear. Whether Mr Edwards gets a second term may depend in part on whether Republicans manage to make much of his party affiliation. Mr Trump remains a popular figure in Louisiana; national liberal icons like Nancy Pelosi, less so. Mr Edwards, who is known to love hunting and hate abortion, has so far avoided being closely associated with the national Democratic Party. Winning a second term will probably require him to continue in that vein.